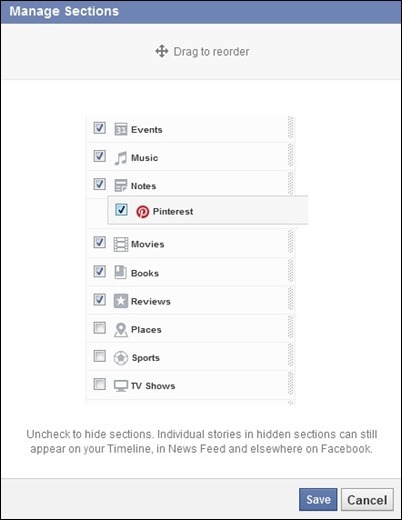 When Facebook introduced Timeline instead wall of the classic, The tabs available in the right sidebar under profile picture (e.g Info, Pictures, Friends, Notes) Were moved immediately below Cover Photo. In addition, their number increased, the added tabs in November such as Music, Movies, Books, Groups, Events and so on Among them are only visible permanently tabs About us, Pictures si FriendsThe remainder being grouped under the tab Sea. But these tabs are available in the form of sections in Sidebar displayed to the left of the Timeline. If you wish to change the order of tabs grouped under Sea to have faster access to sections used more often, and also if you want to hide certain sections because they are not visible from the timeline, you can do so by following the instructions below. 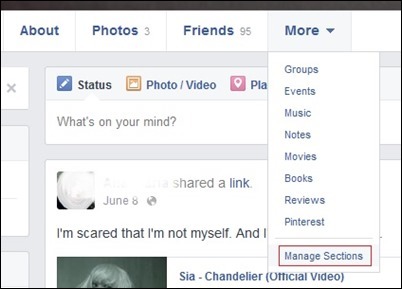 How can we rearrange the order of tabs in Facebook Timeline (and sidebar sections displayed in the Timeline)? And that's it! In this way you can rearrange the order of sections displayed in sidebar Timeline and under the tab Sea (Cover Photo below). Note: Please note that updates made to the hidden from Timeline will still appear in News Feed and can also occur in the timeline (to hide the Timeline, click the down arrow displayed in the top right corner of the update and select Hide from Timeline).